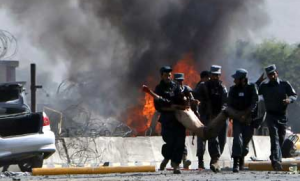 At least 15 people were killed by early-morning suicide bombings in Afghanistan, officials say. Eight civilians and three policemen were killed by a blast at a local government office in Herat, while another four policemen were killed by three suicide bombers at a police compound in southern Helmand province. In the Helmand attack, two of the bombers had explosives strapped to their chests; the third was killed by police. While Helmand is frequently targeted by insurgents, Herat has been relatively quiet, although it did see an uptick in violence during protests in February after U.S. troops inadvertently burned the Quran. This entry was posted on April 10th 2012 at 3:09pm/15:09 and is filed under World News. You can follow any responses to this entry through the RSS 2.0 feed.